Situs ini dibuat sebagai wadah alumni maupun karyawan Eternal periode tahun 1982 hingga sekarang. Harapan kami, situs ini menjadi alat komunikasi bagi alumni maupun karyawan yang masih bekerja di PT. Eternal Buana Chemical Industries. Anda bisa menuliskan pengalaman, tips dan trik atau apapun yang sifatnya bermanfaat bagi kita semua. Semoga dengan dibangunnya milis ini silahturami diantara kita tetap terjaga. 1.The Dead Sea Scrolls were discovered in eleven caves along the northwest shore of the Dead Sea between the years 1947 and 1956. The area is 13 miles east of Jerusalem and is 1300 feet below sea level. The mostly fragmented texts, are numbered according to the cave that they came out of. They have been called the greatest manuscript discovery of modern times. See a Dead Sea Scroll Jar. 2. Only Caves 1 and 11 have produced relatively intact manuscripts. Discovered in 1952, Cave 4 produced the largest find. About 15,000 fragments from more than 500 manuscripts were found. 3. In all, scholars have identified the remains of about 825 to 870 separate scrolls. 4. The Scrolls can be divided into two categories—biblical and non-biblical. Fragments of every book of the Hebrew canon (Old Testament) have been discovered except for the book of Esther. 5. There are now identified among the scrolls, 19 copies of the Book of Isaiah, 25 copies of Deuteronomy and 30 copies of the Psalms . 6. Prophecies by Ezekiel, Jeremiah and Daniel not found in the Bible are written in the Scrolls. 7. The Isaiah Scroll, found relatively intact, is 1000 years older than any previously known copy of Isaiah. In fact, the scrolls are the oldest group of Old Testament manuscripts ever found. 8. In the Scrolls are found never before seen psalms attributed to King David and Joshua. 9.There are nonbiblical writings along the order of commentaries on the OT, paraphrases that expand on the Law, rule books of the community, war conduct, thanksgiving psalms, hymnic compositions, benedictions, liturgical texts, and sapiential (wisdom) writings. 10. The Scrolls are for the most part, written in Hebrew, but there are many written in Aramaic. Aramaic was the common language of the Jews of Palestine for the last two centuries B.C. and of the first two centuries A.D. The discovery of the Scrolls has greatly enhanced our knowledge of these two languages. In addition, there are a few texts written in Greek. 11. The Scrolls appear to be the library of a Jewish sect. The library was hidden away in caves around the outbreak of the First Jewish Revolt (A.D. 66-70) as the Roman army advanced against the rebel Jews. 12. Near the caves are the ancient ruins of Qumran. They were excavated in the early 1950's and appear to be connected with the scrolls. 13. 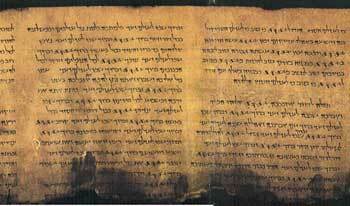 The Dead Sea Scrolls were most likely written by the Essenes during the period from about 200 B.C. to 68 C.E./A.D. The Essenes are mentioned by Josephus and in a few other sources, but not in the New testament. The Essenes were a strict Torah observant, Messianic, apocalyptic, baptist, wilderness, new covenant Jewish sect. They were led by a priest they called the "Teacher of Righteousness," who was opposed and possibly killed by the establishment priesthood in Jerusalem. 14. The enemies of the Qumran community were called the "Sons of Darkness"; they called themselves the "Sons of Light," "the poor," and members of "the Way." They thought of themselves as "the holy ones," who lived in "the house of holiness," because "the Holy Spirit" dwelt with them. 15. The last words of Joseph, Judah, Levi, Naphtali, and Amram (the father of Moses) are written down in the Scrolls. 16. One of the most curious scrolls is the Copper Scroll. Discovered in Cave 3, this scroll records a list of 64 underground hiding places throughout the land of Israel. The deposits are to contain certain amounts of gold, silver, aromatics, and manuscripts. These are believed to be treasures from the Temple at Jerusalem, that were hidden away for safekeeping. 17. The Temple Scroll, found in Cave 11, is the longest scroll. Its present total length is 26.7 feet (8.148 meters). The overall length of the scroll must have been over 28 feet (8.75m). 18. The scrolls contain previously unknown stories about biblical figures such as Enoch, Abraham, and Noah. The story of Abraham includes an explanation why God asked Abraham to sacrifice his only son Isaac. 19. The scrolls are most commonly made of animal skins, but also papyrus and one of copper. They are written with a carbon-based ink, from right to left, using no punctuation except for an occasional paragraph indentation. In fact, in some cases, there are not even spaces between the words. 20. The Scrolls have revolutionized textual criticism of the Old Testament. Interestingly, now with manuscripts predating the medieval period, we find these texts in substantial agreement with the Masoretic text as well as widely variant forms. 21. Some of the Dead Sea Scrolls actually appeared for sale on June 1, 1954 in the Wall Street Journal. The advertisement read — "The Four Dead Sea Scrolls: Biblical manuscripts dating back to at least 200 BC are for sale. This would be an ideal gift to an educational or religious institution by an individual or group. Box F206." 22. Although the Qumran community existed during the time of the ministry of Jesus, none of the Scrolls refer to Him, nor do they mention any of His follower's described in the New Testament. 23. The major intact texts, from Caves 1 & 11, were published by the late fifties and are now housed in the Shrine of the Book museum in Jerusalem. 24. Since the late fifties, about 40% of the Scrolls, mostly fragments from Cave 4, remained unpublished and were unaccessible. It wasn't until 1991, 44 years after the discovery of the first Scroll, after the pressure for publication mounted, that general access was made available to photographs of the Scrolls. In November of 1991 the photos were published by the Biblical Archaeological Society in a nonofficial edition; a computer reconstruction, based on a concordance, was announced; the Huntington Library pledged to open their microfilm files of all the scroll photographs. 25. The Dead Sea Scrolls enhance our knowledge of both Judaism and Christianity. They represent a non-rabbinic form of Judaism and provide a wealth of comparative material for New Testament scholars, including many important parallels to the Jesus movement. They show Christianity to be rooted in Judaism and have been called the evolutionary link between the two. The rugged terrain of the Qumran area.